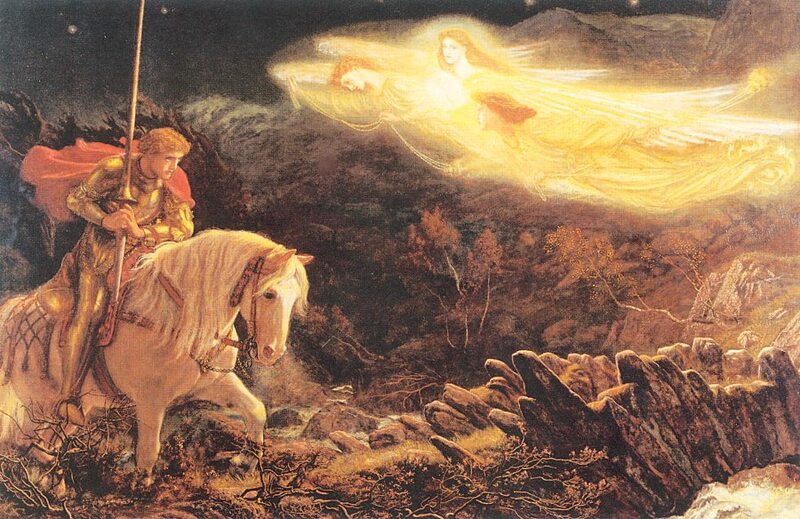 Arthur Hughes (1832–1915), Sir Galahad, the Quest for the Holy Grail (1870), oil on canvas on panel, 113 × 167.6 cm, Walker Art Gallery, Liverpool, England. Wikimedia Commons. Contemporary romantic poems and the legends of the mythical King Arthur of Britain of around 500 CE were central themes in much of Pre-Raphaelite art. Although never a member of the Pre-Raphaelite Brotherhood itself, Arthur Hughes (1832–1915) ‘converted’ to its ideals and style in 1850. He had studied at the School of Design in London from 1846, and progressed to the Royal Academy Schools the following year. Over the period from 1850 to 1875, he painted several of the popular Arthurian legends, and related stories. From 1855 onwards, he started illustrating books, and his drawings achieved fame alongside the texts of Tennyson’s Enoch Arden, Thomas Hughes’ Tom Brown’s School Days, and Christina Rossetti’s poetry. His son, Arthur Ford Hughes (1856-1914) was a less well-known painter, and he was the uncle of Edward Robert Hughes (1851-1914). 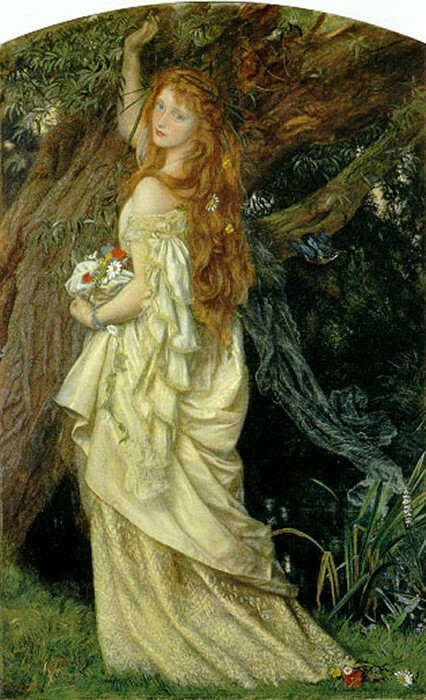 Arthur Hughes (1832–1915), Ophelia (first version) (c 1851-1853), oil on panel, 68.6 × 123.8 cm, Manchester Art Gallery, Manchester, England. Wikimedia Commons. Of his leading female roles, Shakespeare’s Ophelia (Hamlet) and Juliet (Romeo and Juliet) have been the most popular with artists. 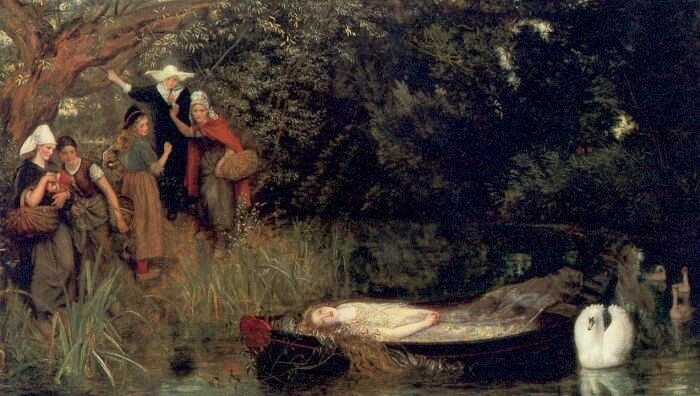 Hughes’ first painting of Ophelia (c 1851-3) was started soon after his initial success in exhibiting his Musidora (1849) at the Royal Academy, and was one of his first Pre-Raphaelite works. It shows Ophelia sat under a willow tree, by the stream in which she is shortly to drown herself, having been driven to madness by Hamlet’s murder of her father, and his rejection of her love. To ensure that the viewer is in no doubt as to the moment which he shows us, Hughes inscribed the relevant lines from Hamlet Act 4 Scene 7 around his painting. Although it meets the criteria for a narrative painting, with its forward reference in the stream, it conveys no sense of the imminent tragic outcome, relying on the viewer’s own knowledge of the original play. 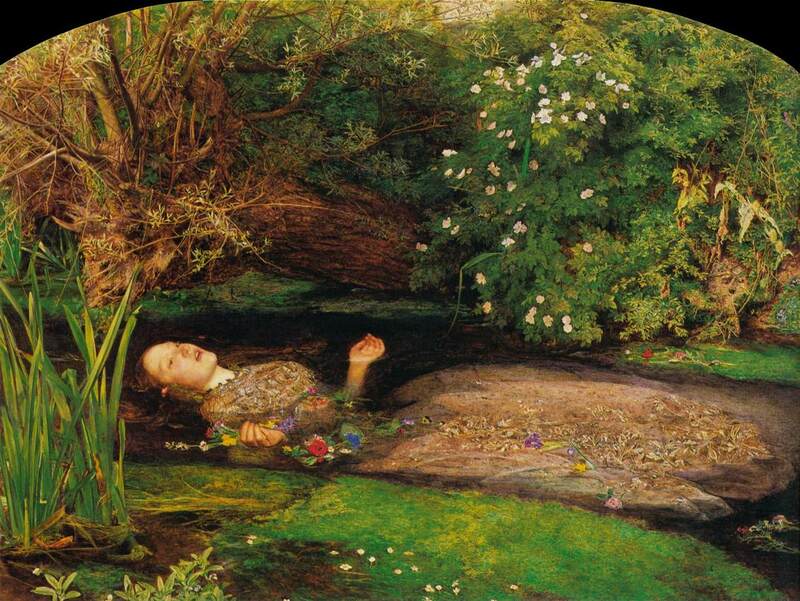 It was John Millais who painted the story’s resolution at almost exactly the same time, in his Ophelia (1851-2), showing Ophelia’s drowned body in the water. 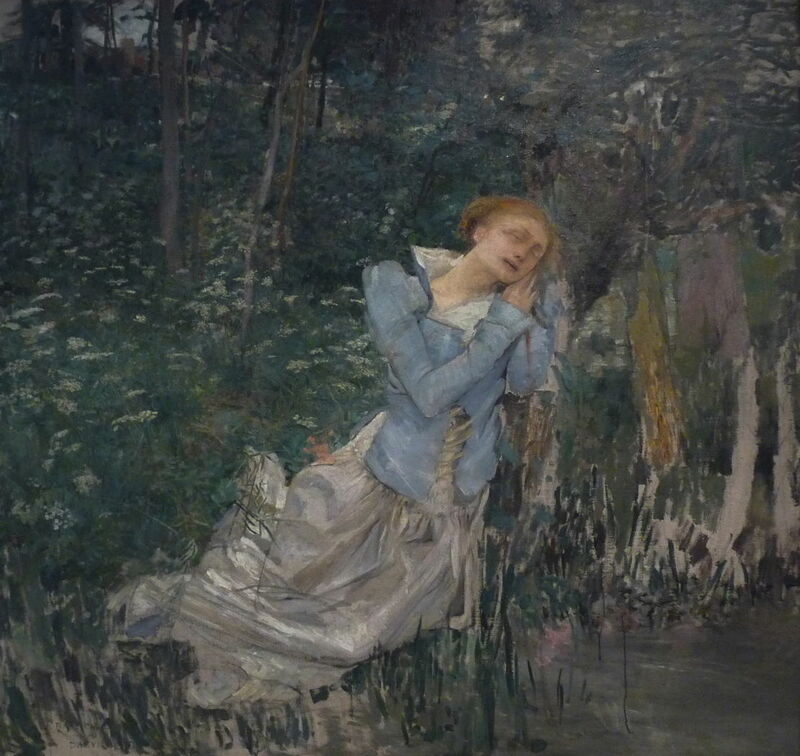 Another interesting comparison, outside Pre-Raphaelite circles this time, is with Jules Bastien-Lepage’s unfinished Ophelia (1881), in which her face expresses strong emotion, and her toppling into the water seems imminent. Arthur Hughes (1832–1915), Ophelia (“And will he not come again?”) (second version) (c 1863-71), oil on canvas, 94.5 x 59.5 cm, Toledo Museum of Art, Toledo, OH. The Athenaeum. 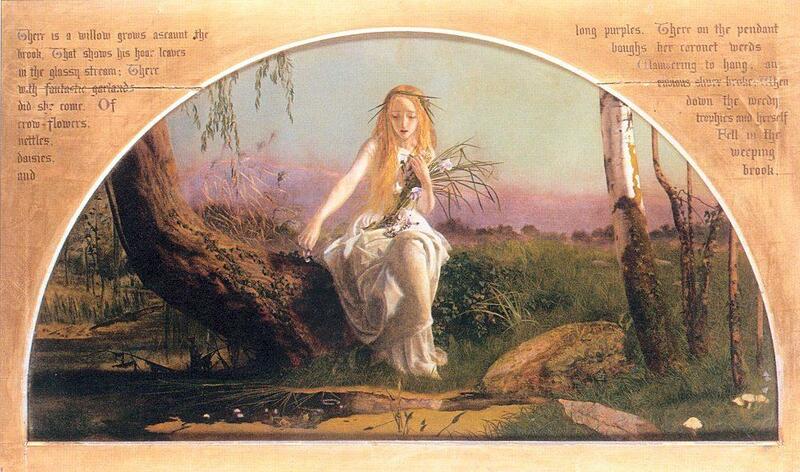 Despite that reference to a scene which takes place inside the castle, Hughes has painted Ophelia some minutes before her drowning, when she is picking wild flowers and standing in front of an old willow tree which overhangs a much more substantial body of water. The latter is almost black in the deep shade, and is revealed as water only by the presence of a few bright reflected objects on its surface. Rather than picturing a moment closer to the tragic climax of this story, Hughes has moved slightly away from it, and its reading is just as reliant on knowledge of the original play. While Hughes was studying at the Royal Academy Schools, Holman Hunt painted his The flight of Madeline and Porphyro during the drunkenness attending the revelry (The Eve of St. Agnes) (1848). This is based on John Keats’ poem The Eve of St. Agnes (1819). Madeline has fallen in love with Porphyro, who is an enemy to her family. Older women have told Madeline that she can receive sweet dreams of love on the night of St. Agnes Eve, which precedes the day on which the patron saint of virgins is celebrated (21 January). On that night, Porphyro gains entry to the castle in which Madeline lives, and looks for Angela, who remains a friend to his family despite the feud. Angela reluctantly agrees to take him to Madeline’s room, so that he can gaze at her sleeping there. Once there, he hides in a large wardrobe, and watches her prepare for bed, seeing her full beauty in the moonlight. He then creeps out to prepare a meal for her, but she wakes partially, and seeing the same figure which she had just been dreaming, takes him into her bed. She then wakes fully and realises her mistake. They declare their mutual love before escaping from the castle past drunken revelers, and flee into the night. 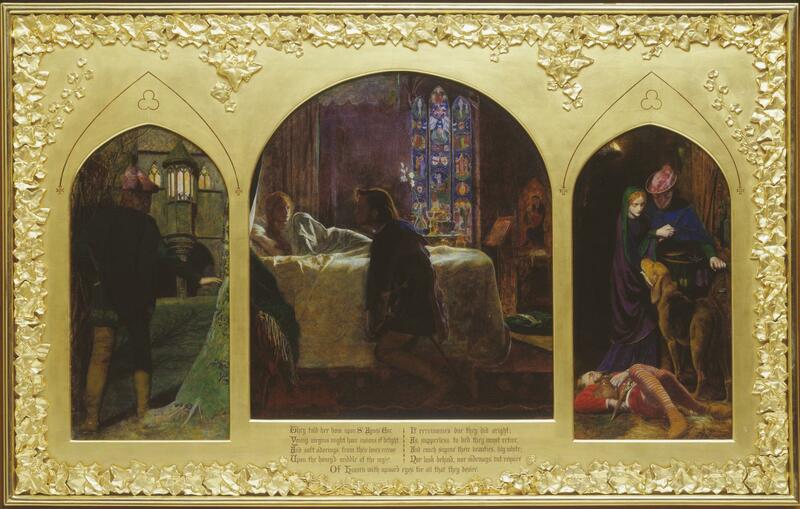 Rather than Holman Hunt’s elaborate and ingenious composition, Hughes opts for a triptych, read from left to right. At the left, Porphyro is approaching the castle. In the centre, he has woken Madeline, who has not yet taken him into her bed. 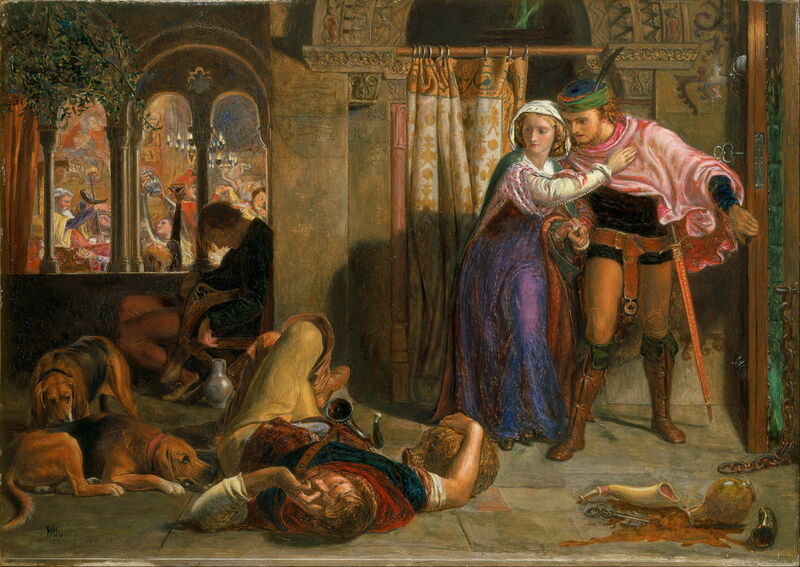 At the right, he almost quotes from Holman Hunt’s version, showing the couple’s escape over drunken revellers. There is also a second, undated version in the Ashmolean, Oxford, in which the painting at the left shows a slightly later moment, where Porphyro meets Angela at the entrance to the castle. Upon the honey’d middle of the night. This painting was very well received when shown at the Royal Academy in 1856, with the critic John Ruskin, and painter Dante Gabriel Rossetti being enthused by it. You want a helpmate, not a mistress, sir. Hughes’ painting shows Romney at the left, a decidedly androgynous figure, just after his rejection, about to take his leave of Aurora. She stands clutching a book of her poetry, which he has just been making fun of. Both stare wistfully into the distance, but neither at the other. Romney’s hat was reworked twice; as its paint has become less opaque over time, traces of the earlier forms can be seen. Its narrative effect is curious. It does contain the backward reference of the book of poetry, but the moment chosen is sufficiently after the climax of the story to make the painting look static and only weakly narrative. Miss Heaton had wanted Hughes to show the quarrel leading to the rejection; the critic John Ruskin was brought in to mediate, and sided with Hughes. The painting was not shown to the public in Hughes’ lifetime, and it was only in 1964 that Rosalie Mander rediscovered it and established its obscure story. The Holy Grail, a central theme in many tales of Arthurian legend, was a vessel with magical powers which range from providing happiness to eternal youth and food. It was originally supposed to have fallen from the sky, but in the twelfth century became entangled with the legend of the Holy Chalice, the vessel used to serve wine at Christ’s Last Supper, and further enhanced when later writers claimed that it had also been used to catch Christ’s blood when he had been taken down from the cross. Hughes’ painting of one of the more prominent knights of the Round Table of Camelot in quest of the grail is dominated by the neutral and protective ‘grail angels’, who cast their golden light over the night scene. This was probably based on Tennyson’s poem The Holy Grail published in 1869 as part of his collection of Arthurian legends retold in The Holy Grail and Other Poems. This may represent the moment when, having left Sir Percivale behind, Galahad is taken up to a heavenly city in a boat like a silver star. Many of the Pre-Raphaelites painted The Lady of Shalott, taken from Tennyson’s Arthurian ballad of that name, published in two versions, in 1833 and 1842. It was elaborated from the story of Elaine of Astolat, as retold in the obscure thirteenth-century Italian novella Donna di Scalotta. 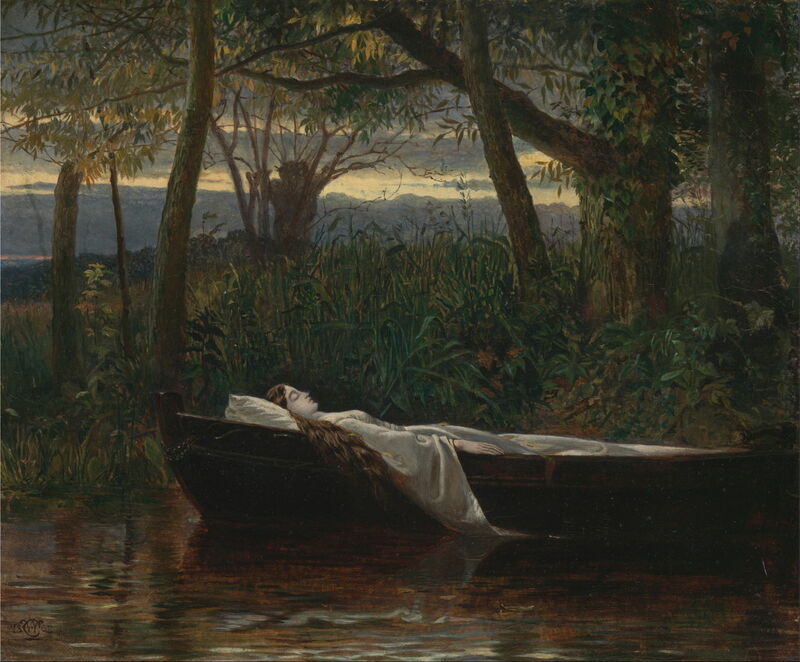 Walter Crane’s painting of 1862 shows the classical end-point, of the Lady dead in her boat in a wood near the castle. Hughes chose the same moment, which is after the climax of the story, but brings in not Sir Lancelot to voice his short eulogy, but a nun and four peasant women instead. 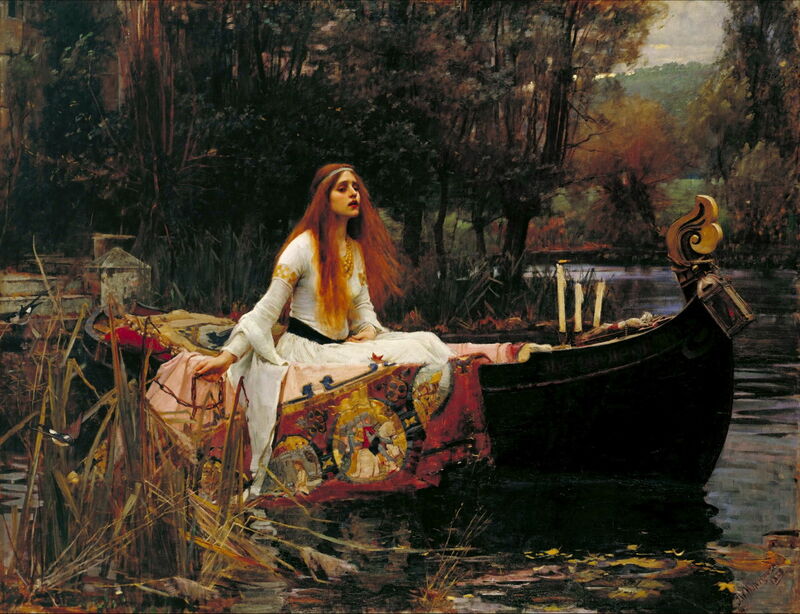 Later still, JW Waterhouse (1888) preferred to show the Lady, already suffering the consequences of the curse, as she sets out to drift downstream. 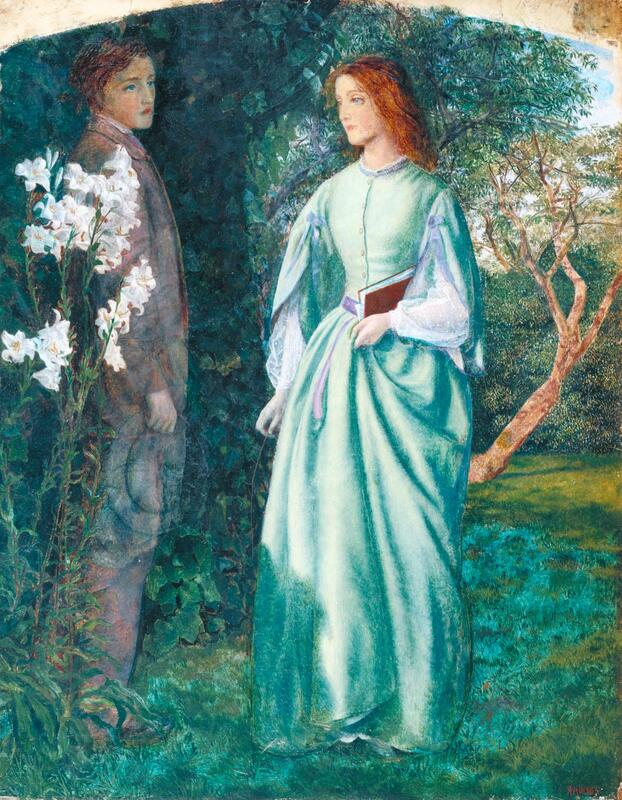 Arthur Hughes’ narrative paintings may meet the definition of narrative, in having forward or backward references, but are generally static tableaux. Where there is the potential for action, as in his Sir Galahad, the Quest for the Holy Grail (1870), that is exploited little. This is in keeping with the Pre-Raphaelite approach to narrative. His earlier narrative paintings, in particular, were reliant on inclusion of text quotations on the canvas, and most needed the viewer to be very familiar with the written source of the story. Although effective, this limited their accessibiity and appeal. Poulson C (1999) The Quest for the Grail, Arthurian Legend in British Art 1840-1920, Manchester UP. ISBN 978 0 7190 5537 9. Posted in General, Painting and tagged Arthur, Hughes, myth, narrative, painting, Pre-Raphaelite, Shalott. Bookmark the permalink.